Instead, he uses the iron rods as pole pieces, or 'north" and "south" ends, of a magnet - either an electromagnet or a permanent magnet. Bubbles of gas rise through the twin columns of acidulated water, to be collected and analyzed. As might be expected, nearly all of the gas is hydrogen, liberated by a commonplace chemical interaction between the iron rods and the dilute sulfuric acid, one percent by volume, in the water. But the phenomenal part of the experiment is that oxygen also turns up, Dr. Ehrenhaft recently told the American Physical Society. To be specific, it is found in clearly measurable proportions ranging from two to 12 percent of the total volume of gases. When the gases obtained with a permanent magnet are separated, the larger proportion of oxygen is found above the north pole of the magnet. After rigorous precautions - including short-circuiting the magnet poles with wire, so that the poles will be at the same electric potential - Dr. Ehrenhaft concludes that there is only one place the oxygen can possibly come from. And that is from water decomposed with a magnet! Without a magnet, pure hydrogen is evolved. There is an interesting sidelight to this experiment. A strong permanent magnet of the Alnico type suffers a marked loss of strength - say, 10 percent in 24 hours - after being used to decompose water, Dr. Ehrenhaft observes. In fact, makers of the magnets, which are supposed to last for years without material change, have viewed what happens to them with astonishment and dismay. But no fault lies with their products. Energy from an electric battery is used up in decomposing water, and it would be only reasonable to expect energy stored up in a permanent magnet to be drained likewise. What gives the utmost significance to the reported feat of breaking up water with a magnet is the fresh evidence it offers for the existence of "magnetic current," or a flow of magnetically charged particles, which has been suspected by noted pioneers and which Dr. Ehrenhaft now maintains he has proved. Confirmation of this amazing discovery would point to a possible future rival of electric current, perhaps capable of being harnessed in undreamed-of ways. But would the dictum of "no separate magnetic poles" still hold true in a far more delicate test - say, if you substituted microscopic particles of iron or other magnetic metals, as tiny as particles of smoke, for the massive chunk of rock that Peregrinus used? Dr. Ehrenhaft has tried it. In an air gap between the north and south poles of a magnet, he sets up what he calls a homogenous magnetic field, that is, with the lines of magnetic force absolutely parallel. In this field, he finds, the metal particles move toward the north or south pole, reversing their direction according to the direction of the magnetic field. On the particles, he concludes, there must be an excess of north or south magnetic charge. Expanding the terminology of Faraday, he calls the particles magnetic ions. They are the single magnetic poles shown at the lower right of the colored drawing. 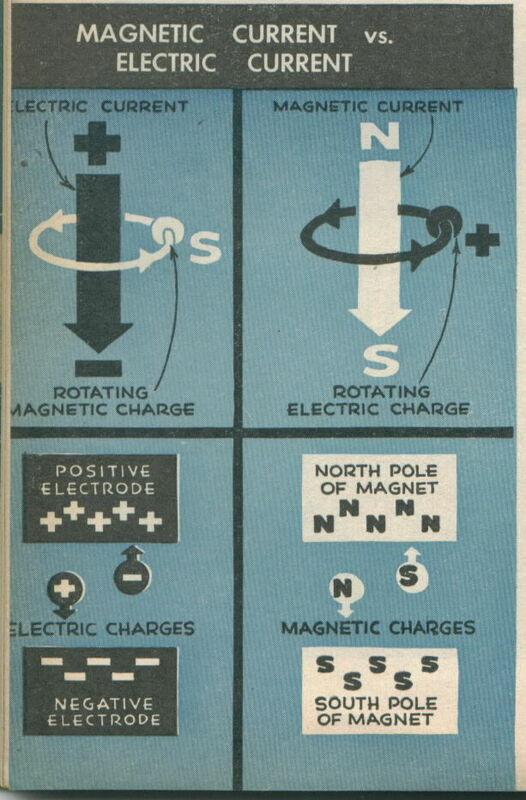 Instead of bearing plus or minus electric charges, as familiar ions do, they carry north or south magnetic charges. Now, just as traveling electric ions form an electric current, why shouldn't traveling magnetic ions form a magnetic current? See for yourself another of Dr. Ehrenhaft's startling experiments, and draw your own conclusions. 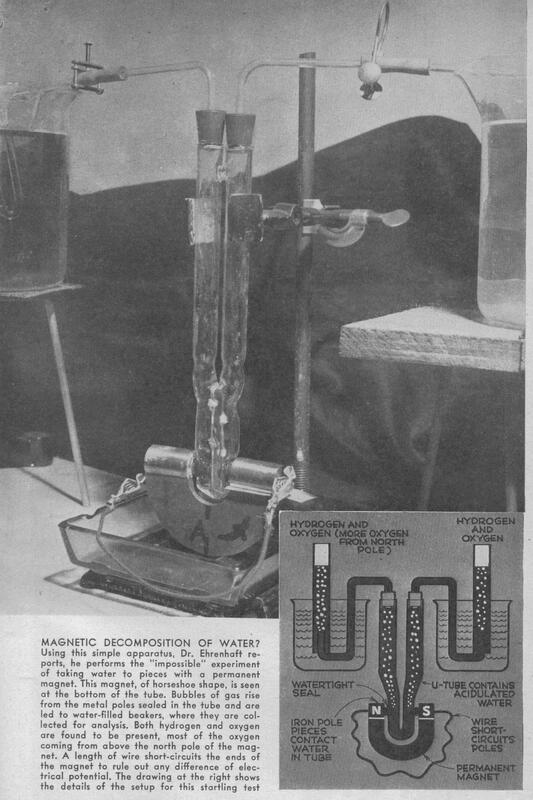 This time the heart of the apparatus will be a small glass cell, fitted as before with pole pieces of pure iron that dip into water containing one percent of sulphuric acid. An electromagnet, turned on or off at will energizes the poles. From a projector, a powerful beam of light converges upon the narrow gap between the pole pieces, and a low-power microscope, mounted horizontally, reveals what happens there. Adding a camera provides a permanent record. You begin with the Magnet turned off. Looking into the eyepiece of the microscope, you see streams of bubbles rising from both pole pieces. They are of hydrogen gas, liberated by the same chemical action as in the first experiment. Throw the switch that turns on the magnet, and the scene abruptly changes. Stopped dead in their tracks, some of the bubbles cling to the pole pieces. Others leave one pole and travel to the other. Dr. Ehrenhaft calls special attention to bubbles moving downward against their own buoyancy, impelled by some unseen force stronger than gravity. Meanwhile a spectacular phenomenon has been developing - a miniature merry-go-round of gas bubbles between the faces of the poles and parallel to them. Incapable of being shown adequately in a time exposure, the effect nevertheless appears plainly as a white blur, when the upper magnetic pole is given a conical shape for photographic purposes. Visual observation, shows striking details. If copper particles, say, have been added to the acidulated water, they will rotate in the same plane as the hydrogen bubbles, but in the opposite direction. For both, the speed of the whirligig depends upon the strength of the magnetic field. Reverse the polarity of the magnet, and each set of particles spins in the opposite direction. Bubbles or particles that travel between pole pieces of a magnet behave just as if they were magnetic ions, or clusters of them - repelled by like magnetic poles, and attracted by oppositely magnetized poles. This corresponds exactly with the way that "electric" or ordinary ions interact with positive and negative electrodes. And as for the ring-around-a-rosy behavior of the hydrogen bubbles and copper particles, Dr. Ehrenhaft concludes that these are electrically charged particles - ordinary ions - rotating about a magnetic current. This would be an exact counterpart of the classical conception that magnetism rotates about a current-carrying electric conductor. Now the staggering implications of Dr. Ehrenhaft's observations begin to unfold. 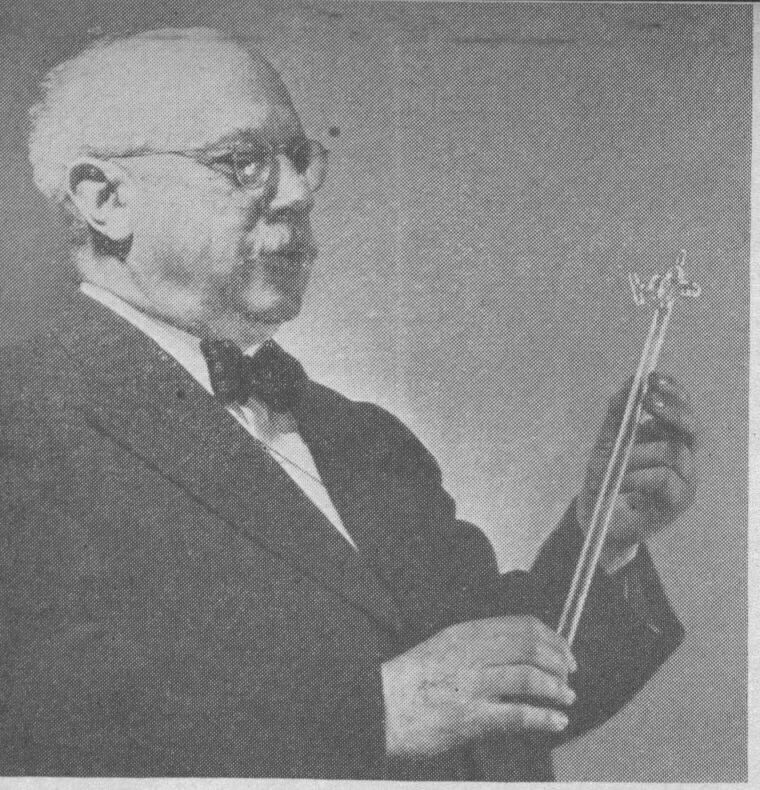 Existence of such a thing as magnetic current, once established, would pave the way for industries as gigantic as those that the discovery of electricity led to in its time. A "gold rush" for practical applications might be expected. Patents for them would command fabulous sums, since inventions employing magnetic current would be basic. What form they may take, no man can foresee, and Dr. Ehrenhaft cautiously declines to hazard a guess. Yet a visitor to his laboratory cannot resist the temptation to let his imagination run free. New kinds of motors and generators? Better ways to transmit power? Transformers that will work on direct current instead of alternating current? Atom smashers? Radical methods of seeing things in the dark, and through microscopes and telescopes? Ways to tap power from the magnetism of the earth itself? And, in your home, substitution of magnetic current - who ever got a shock from it? - for electric current? Pure dreams, all of them, today - but some of them, perhaps, realities of 2044. Before magnetic currents could be put in harness, of course, a myriad of questions about their behavior remain to be studied and answered. So far, no one knows whether they can be led through wires, like electric currents, as well as through conducting liquids. If so, the wires might be of entirely different materials than the best conductors for electricity. Likewise, the most effective insulators for magnetic current might be substances totally unlike those used for electrical insulators. The whole subject offers as vast a field for pioneering research as electricity did a century ago. And now, as then, an amateur experimenter puttering in his basement stands as good a chance of making an epochal discovery as does a distinguished scientists in a great laboratory.